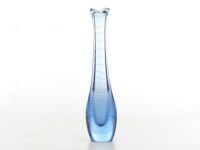 Aseda Glasbruk was a Swedish glass factory that operated in the town of Åseda between 1947 and 1977, was incorporated into the Royal Krona group in 1975 which went into liquidation in 1977. The firm's chief designer was Bo Borgstrom, who graduated from Stockholm's Swedish School of Arts and Crafts in 1951. Borgstrom was widely acclaimed as a ceramics artist before joining Aseda in 1961.